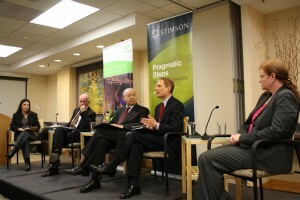 On Monday April 16, I attended an event in Washington, DC where senior State Department officials gathered with representatives of the US arms industry, NGOs like Oxfam, and members of the public to discuss the US position on the Arms Trade Treaty. The event provided the US government with an opportunity to lay out its positions on the Treaty in anticipation to the negotiations at the United Nations in July. You can watch the event here. For years Oxfam has been calling for a robust Arms Trade Treaty (ATT) that will help to stem the flow of weapons to irresponsible end users. A robust and comprehensive ATT can help save innocent lives, contribute to economic development, promote regional stability, and protect human rights. Private sector, NGO, and State Department representatives at a panel discussion following Assistant Secretary of State Thomas Countryman’s speech as part of Monday’s event on the Arms Trade Treaty. At the event, the Assistant Secretary of State for International Security and Nonproliferation, Thomas Countryman, made a speech outlining the US position on the treaty negotiations. The speech contained very positive elements but also some positions that I have a hard time understanding. On the positive side, Assistant Secretary Countryman stated that the US is open to suggestions from other countries on ways to include ammunition within the treaty’s scope. This is a major shift in the right direction; prior to this speech, the US position was that ammunition must not be included in the treaty in any circumstance. Factors to consider? Keep in mind? This position is unacceptable. The US seems to hold the position that as long as a government “considers” the impact of the arms transfer and “keeps it in mind,” the treaty should allow states to transfer weapons to war criminals or human rights abusers. Such an Arms Trade Treaty would significantly lower the current international standards on respecting human rights and the laws of war, and it runs contrary to the US position on human rights and international humanitarian law at the United Nations. International humanitarian law, as established by the Geneva Conventions, requires that all state parties “undertake to respect and to ensure respect for the Convention in all circumstances.” Ensuring respect for the laws of war is a far cry from “considering” or “keeping in mind” the laws of war when providing war criminals with the tools to commit their heinous crimes. The UN Charter (which is international law) contains an obligation on all members to promote and respect human rights. How would a treaty that gives states the right to transfer weapons to human rights abusers as long as the exporting state “keeps in mind” their obligations under international law be reconciled with the obligation to promote respect for human rights? After hearing Assistant Secretary Countryman’s speech, I am left asking how the US position on the ATT can be reconciled with Ambassador Rice’s vision for using the US voice and vote at the United Nations. First, I misunderstood the US position. If this is the case, I hope to hear from the negotiators where I am wrong. Second, maybe Ambassador Rice’s strong call for a new era of support for international humanitarian law was just empty rhetoric. Yet, given Ambassador Rice’s strong efforts in support of civilian protection at the UN since she arrived, I do not think her words were empty rhetoric. Third, maybe the new era of support for international humanitarian law is over, and we are in the era of “keeping in mind” international humanitarian law. Or fourth, those leading the development of the US position on the Arms Trade Treaty didn’t receive the memo and are still operating in the old era. I can understand if Assistant Secretary Countryman and the others designing the US position on the ATT didn’t get the message that the Obama administration is operating under a new era and that the US will work to safeguard human rights and humanitarian law at the United Nations. Yet, with less than three months until the negotiations of the ATT commence, someone better resend the message…Quick! Where is the American development and humanitarian voice in the ATT negotiations?